I’ve been a fan of Trill Zapatero’s art and fashion for a while now, and with these new cardigans I feel she has hit her stride with mesh. Her new patchwork cardigans have gorgeous textures (as usual) and a nice scrunchy casual feel to them. I mixed in a couple of items I got at the new round of gatchas at The Arcade as well, notably the comfy fairisle slipper boots. The picture was taken at the entry point to Alirium Gardens, where butterflies swirl round in the darkness. 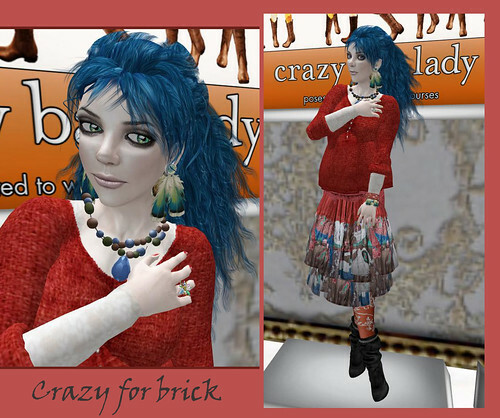 Another brick colour for the 52 weeks of colour challenge. 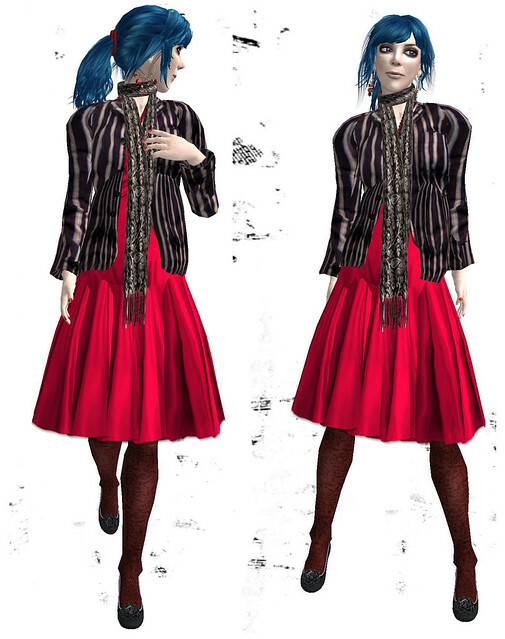 I started out with the Oyakin sweater (it looked very bricky in the vendor) and some Amacci hair that I just bought, then pulled out the skirt, leggings, undershirt and boots from my inventory. I played around with jewelry that I already had, too, but then I was lured into the Jewelry Fair (see previous post), so I’m showing off some of my foolish purchases. I love practically anything with peacock feathers, and ended up with 2 sets of peacock feather earrings: the ones I’m wearing and another pair that came with the bracelet (left arm) and a matching necklace. I came across a couple of designers I had forgotten about, like Aliunn, who created the leather bracelet that I’ve got on just above the feather one. Then I tried out the poses in the Croire booth – they are “Crazy Bag Lady” poses, but when my head blocked out the “bag” it seemed to fit me perfectly. 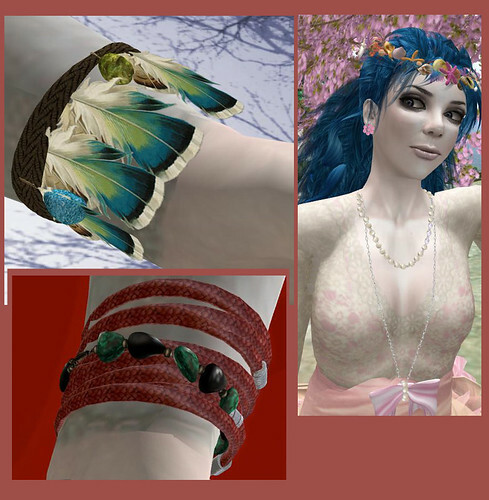 As the bracelets don’t show up well in the first picture, I show them below, plus a gatcha bracelet from Earthstones’ booth (the green one, worn together with the red wrapped bracelet). I’ve also included a more detailed picture of the crown and necklace in my last posting: the crown was from Centopalini and the Bow Necklace a free item from Fairy Tail. A quick post, as I’ve felt happy in this summery outfit. 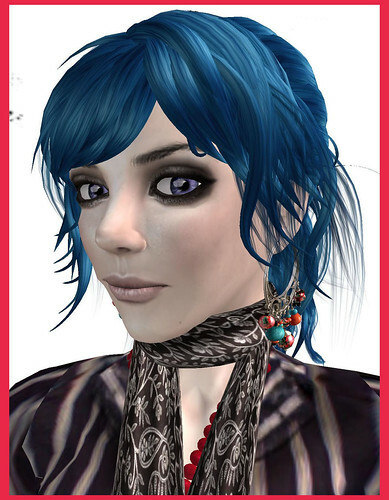 The first picture was taken in the Happy Mood shop and the second set in the remodelled Cupcake sim. After I had done most of the photos I noticed a pretty top by Moho Inc, which I used as an undershirt in the last picture: it has a cute zip. I’m a bit late with my 52 weeks of color challenge post this week, but I actually decided pretty quickly that I wanted to wear this silky red dress. I think it was created to go with vampy high heels, but I thought I would work it into a more “boho early evening dinner” kind of look. Does this count as yellow? I’m not sure this counts as yellow: I started with good intentions, but a lot of green crept in (not normally a colour I wear, it tends to clash with my hair). 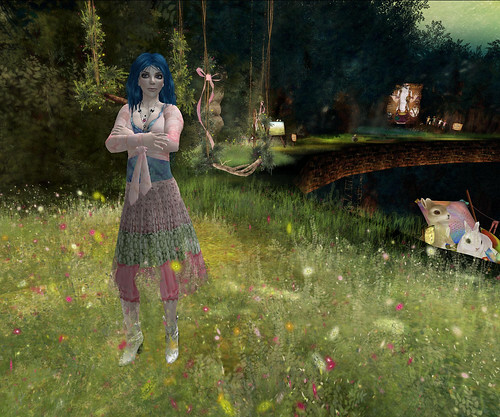 This patchwork dress came out last year but I still think it’s great, and the colours tone nicely with the (luc) set. They all have distinct patches of yellow, honest… Undoubtedly yellow is the Swirly Cardigan. However, I’m afraid it degenerates into dark green as far as the rest of the clothes go. The snowmen look pretty happy about it, though. 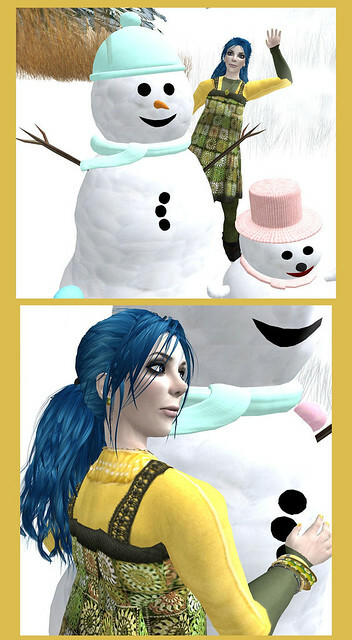 This is week 6 of Luna Jubilee’s 52 weeks of colour challenge and here is her yellow “starter post! Goldenrod was this week’s 52 weeks of colour challenge and of course it was certainly harder than blue, but I found a surprising amount of yellow in my inventory. I did actually find some tights that were “goldenrod” in colour, but I thought they looked a bit yucky (they were more like mud, frankly). This skirt was the starting point – I think it might have been a hunt gift or a lucky board item. I went for triple layering on my top half, and I rooted out this necklace, which has really good quality colour-change options.